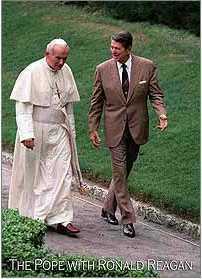 Trading Card of Pope John Paul II with Ronald Reagan. Paradigm Trading Cards (www.paradigmtradingcards.com) today announced their release - "A Pope for the Ages" - a special, limited edition trading card set celebrating the life of Pope John Paul II. Each of the 20 trading cards in the set features a highlight in the life of one of the most influential men of the last century. "'A Pope for the Ages' trading cards are limited to just 25,000 sets," said Mark Currier, President of Paradigm Trading Cards. "We realize that this is an extremely limited quantity for a man that is admired by hundreds of millions of people around the world, but we are committed to keeping our production numbers low in order to ensure the long term value of this commemorative edition." "Pope John Paul II is without a doubt one of the most influential world leaders of the last century," said Currier. "Not content with just being a spiritual leader, John Paul II made it his responsibility to awaken the world to the dignity of human rights. Pope John Paul II will forever be remembered as a great man of God, and as a man of the people. He was indeed, a Pope for the ages." To order "A Pope for the Ages" limited edition trading cards, or for more information visit: www.johnpauliitradingcards.com.